Angela Maiers is leading a charge in education. Her mantra is simple but profoundly powerful. 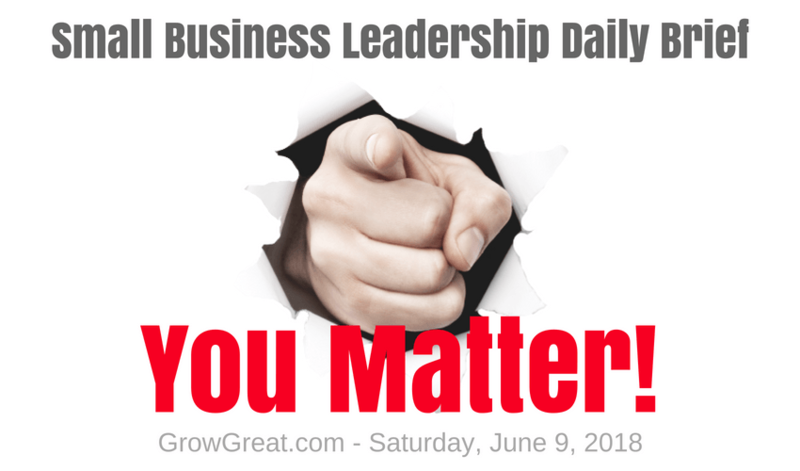 Just two words: You Matter! I know Angela and like her. She won’t mind me using her 2-word tagline to make today’s point. Pushing her message forward is just a side benefit to today’s brief. I hope you’ll check out her work. But my main reason for today’s brief are the two most news notable suicides that have occurred – Kate Spade and Anthony Bourdain. Accomplished and successful by most visible standards, these two mature people (Spade was 55, Bourdain 61) figured ending their life was the option they’d take. This week wasn’t extraordinary. Desperate people – people others don’t think are desperate – do desperate things every single day. While the names may not always make national or global news, loneliness and despair overpower people. Some, like Spade and Bourdain, take the most drastic step. Others embrace destructive behaviors grasping for something to hang onto. I’m not a mental health professional. I do know it’s not one of those “it’s just in your head” kind of deals though. Mental health must be taken as seriously as physical health. When you stop to think of the people who suffer some physical ailment undiagnosed – like cancer or a heart condition – remember, there are also many people (likely people you know) suffering undiagnosed mental health issues. Loneliness and feeling lack of connection with others – deep enough connections that make you feel safe, heard and loved – is often a culprit according to professionals. Business owners and CEOs have to live up to an ideal. Resilient, tenacious, unfazed. Those are the qualities we feel we must display. 100% of the time. Vulnerability is hard. But so stinking powerful. Which is why I preach it every single day to business owners and leaders. Find somebody or a few somebodies with whom you can be completely safe. As Dr. Henry Cloud (I’m such a fan) says…someone with whom you can be “careless.” Not in the sense of being reckless, but in the sense that you trust them so much you know they won’t use anything you say or do against you. They’ll be there to help you. Not judge your every decision. Sadly, many high achieving business leaders don’t have somebody like that. What they do have is pressure-filled relationships. People who want something from them. People who need something from them. Eyes and ears always focused on them. I get it. We exist in a world where outwardly we have to put our best face on. Covering up anything that may be bugging us. Certainly hiding our pain and worry. Nobody wants to buy from a business owned by a person with problems, right? It’s not hypocrisy. It’s professionalism. And it’s our privacy. We protect it. Way more when it comes to our actual personal presence than our online presence…sometimes. Scroll through Instagram, Facebook, Linkedin or Twitter and you see us all putting our best foot forward. Sure, some people are faking it all, but that’s not us. You and me, we’re focused on making ourselves and our businesses attractive to prospects. We have honorable intentions. We deeply believe in our services and products. We know we can serve people well. Solving problems our prospects face. Helping make our customers’ lives better! Yes, we want to hit the trifecta of business building. We all want and need new customers. We all need to find ways to serve our existing customers better. Customer demands continue to go higher and we’ve got to match those demands or our businesses become irrelevant. And the last leg of the trifecta is not going crazy in the process. We’d like to achieve killer business success without losing ourselves. Money. Success. Stuff. They won’t help us hit the last leg of the trifecta. Wealthy, successful and high achieving people fall off the ledge daily. For a variety of reasons. We don’t have to obsess about each individual problem. But we do need to focus on the general remedy for every single person – deeper, safe, trusting, caring, compassionate connections with other people. It begins with thinking and then really believing that YOU MATTER! Consider the impact you’re making on the world. Even if it’s just your little corner of the world, it’s a big impact. And here’s the real rub — it’s not predicated on your being some high achieving, successful business owner. It’s predicated on you being YOU. My parents. My wife. My kids. My grandkids. My close friends. They’re not important to me and I’m not important to them because of any financial accomplishments. My love for them and their love for me isn’t nearly that shallow! These people have seen me fail. They’ve seen me weep. They love me and I love them because of who and what we all are as people. Supportive. Encouraging. Serving. Don’t confuse yourself with your business. Your company is a reflection of you, but it’s not you. And I’m not saying your business doesn’t matter, but I am saying it doesn’t 100% define you – unless you let it. Don’t. Let it. Today is Saturday. Think about the value YOU – as a person – provide. Not your business. It’s fine to consider your value in the context of your business. You should. But that’s just one element of your life. I come home to my wife. I come home to my family. Not my business. Let’s wrap up this week with one final idea that I’d ask you to think about. Really think about it. Think about the people who matter to you! A great remedy for our own fretfulness, worry and anxiety is service. It begins with being thankful. Thankful for the blessings in our life. For the people who matter. Then it goes to finding ways you can help each of them through their struggles. This isn’t check writing stuff. It’s human touch stuff. It’s you being encouraged and doing some encouraging. It’s you being accountable and holding others accountable. It’s you listening. And you sharing. It’s learning from their experiences. And you willing to share your experiences with them. It’s all that stuff that drives deeper human connections. It’s the stuff that helps us fend off the demons that will cripple us, make us less than all we can be, or worse yet — destroy us.